Tekno RC is making waves in the 1/8th nitro scene. The NB48 has caught a lot of people off guard and we’re ready to follow it up with the all new NT48 1/8th Scale Nitro 4WD Competition Truggy Kit. 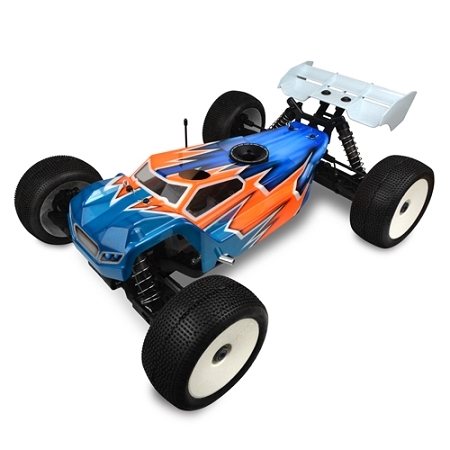 So now we are very excited to introduce the NT48, a completely new 1/8th Nitro Truggy. Built on the hot-selling EB48 and SCT410 platform, it shares many parts already available around the world. But the real fun begins when you start to notice the details and optimizations we put into the vehicle. Like its electric counterpart, the ET48, this is not a conversion – it’s a ground up nitro truggy design. Most of the current truggies on the market have flip-floppy arms and inadequate shock absorbers coupled to undersized shock towers. We set out to change all that with a set of truggy arms that are stiffer and beefier than any others. This makes the suspension much more efficient and results in higher corner speed and a noticeable increase in overall steering and response. Another obvious benefit is the ultimate durability of the arms. They are nearly indestructible. A new set of rear shocks were needed to handle the rigors of truggy racing. Measuring in at 137mm long, they provide excellent bump handling and jump landing. Our current 122mm shocks, standard on the rear of our EB48/NB48/SCT410, are now outfitted to the front of this awesome truggy. CNC machined 8 x 1.3mm pistons are standard, giving you an excellent blend of low speed and high speed damping. 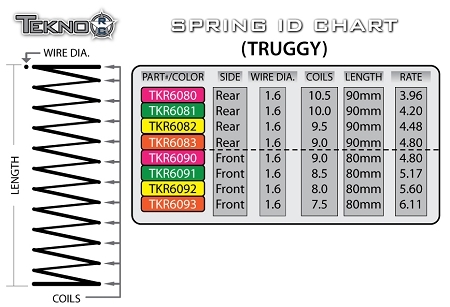 New, truggy specific springs and sway bars finish off the damping package. The last piece of the truggy puzzle were the shock towers. Truggies need more suspension travel than buggies, both up and down. To ensure that any racer could tune in their suspension to any track condition, we supplied the ET48 with more droop than any other truggy. At the same time, there is an abundance of up-travel to make sure the shocks don’t bottom before the chassis does on hard landings or super rough conditions. The front tower stands tall and is a whopping 6mm thick full CNC 7075 gun metal anodized aluminum masterpiece. The rear is 5mm thick and equally impressive. Let’s face it, truggies drive hard and this truggy will stand up to the abuse. 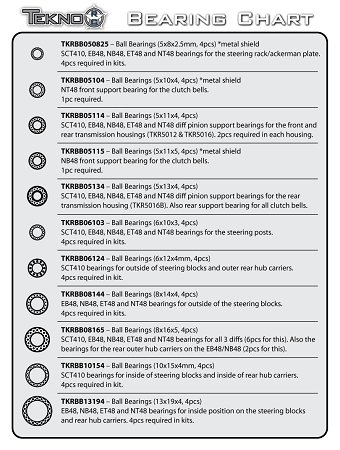 The NT48 builds on the success of the NB48. After computer analysis of dozens of different layouts it became clear that a lot of the current vehicles on the market are not optimized. Some are too heavy on the right side (rear diff output is offset too far). Others are more balanced but the engine and weight distribution aren’t as centralized (rear diff output is not offset enough), producing slower steering response in ‘U’ and ‘S’ sections. The next question was, “do we put the weight forward or back?” How about both? The engine can be mounted in two positions, a front position and an 18mm offset rear position. Under most conditions, the motor forward produces the fastest cornering and subsequent lap times. In very bumpy or very loose conditions testing shows the rear engine position can be easier to drive although not as fast. The last challenge with weight distribution is how low you can place it. Following a design cue from the EB48 and ET48, we created the radio tray and the right mudguard as one piece. This allowed the RX battery to essentially sit on the chassis producing the lowest CG possible. The RX sits right behind the battery and the throttle servo is mounted behind the RX. Wiring is clean and easy with almost no exposed wires. Finishing off the radio tray are integrated transponder, switch, and antenna mounts. The entire radio tray/mud guard can be removed with only 6 screws making cleaning your new nitro ride an easy task. The steering and suspension are direct carryovers from the ET48. Bulletproof suspension arms, silky smooth 16mm bore shocks, precision steering, and a ton of adjustments will keep you headed in the right direction. The differentials are light and extremely durable. They will provide consistent leak-free performance tank after tank. We also decided to include a host of performance parts that are usually options on most other cars. These include lightened aluminum pivot balls, steering posts, lightened gears and outdrives throughout, and CNC tapered pistons. Dry weight is roughly 4040 grams depending on equipment installed. A new style nitro specific truggy body was designed to hug the mud guards and protect from mud and dirt. When you back all of this up with Tekno RC’s unparalleled customer service and community interaction, you have yourself one of the most competitive and innovative truggies available. The NT48 should be available in early 2014 and will be competitively priced with other top quality truggies on the market.